Scott Denning is Monfort Professor of Atmospheric Science at Colorado State University, where he leads a large research group using many kinds of observations and models to understand the metabolism of the Earth’s biosphere. In addition to using global satellite imagery, his research has included extensive field work in the great north woods of Wisconsin, the farms of Iowa, and the Amazon rainforest. 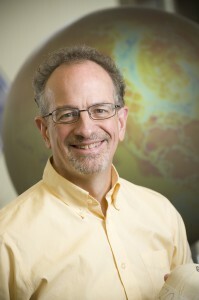 He also serves as Director of Education and Diversity for CMMAP, the Center for Multiscale Modeling of Atmospheric Processes, working to enhance understanding of global climate through K-12, undergraduate, and graduate study as well as informal education and public presentations. He has written about 100 publications in the peer-reviewed climate literature, is a former editor of the Journal of Climate, and served for five years as founding Science Chair of the North American Carbon Program. He takes special delight in engaging hostile audiences on the subject of climate change and has twice been a featured speaker at the Heartland Institute’s annual conference. Denning lives in Fort Collins Colorado with his wife, two young adult sons, a Chocolate Lab, and two cats. He is an avid amateur astronomer and spends clear weekend nights photographing the galaxy from a mountain cabin.